-Is it fair that the city of Boston has the greatest mind in football in Bill Belichick and now the greatest mind in basketball in Brad Stevens? Stevens has been incredible this year. This could be the best team in basketball if they had Kyrie Irving and Gordon Hayward healthy. Best coaching job I’ve seen in years. -Philadelphia just not ready yet. Playoff experience means something. Joel Embid makes critical errors at critical times. Al Hoford getting the best of him at important times. Ben Simmons needs to get a jump shot. He’ll be much harder to defend next year when he works all summer on a jumper. -Jayson Tatum and Terry Rozier have been amazing for the Celtics. Rozier especially clutch in crunch time this series. I’m shocked the Celtics are up 3-0 but then again the Celtics have shocked me all year in what they have been able to do. -Lebron James has put on a show this post-season. He can beat you single-handily like he did for most of the series with Indiana. Watch out when he gets help. The Cavs when they get help from Kyle Korver, Kevin Love, George Hill and JR Smith are tough to beat. Series with Boston should be awesome. -Toronto will never beat Cleveland. If they can’t do it this year then when? 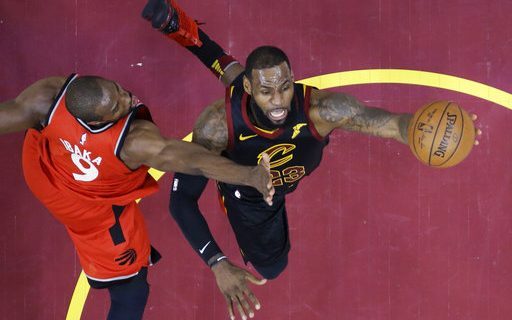 Raptors are making the Cavs look like a good defense team when they are not that at all. Valaciunas isn’t good enough inside. He should have won Game 1 with an easy tip in at the buzzer. Still can’t believe the best option to guard Lebron is AG Anunoby a rookie. DeRozan has come up small again against the Cavs. -How good would the Pelicans be with Demarcus Cousins healthy? Anthony Davis is legit inside. He is a bull and tough for the Warriors to defend. If they had both Cousins and Davis on the floor inside it would great to see how the Warriors would defend. OKC gave them fits two years ago with two big men. -Rajon Rondo is such a playoff performer. He comes up big in the playoffs and has so his career. The team has changed it’s style with him in the line-up in mid-season after Cousins went down. Great coaching job by Alvin Gentry. -Still feel Golden State will pull this series out. I’m so impressed every night with what Klay Thompson brings to the table offensively and defensively. It’s amazing that I think you can make a case that Curry, Durant, Thompson or Dramond Green are their best player. -Houston has proven to me they are the better team. They’ve been the better team in the regular season and have won by a couple of blowouts. -Big post-season for Chris Paul. Will this be the year he is a playoff performer? There are times I still feel he and Harden aren’t on the same page. They better get it straight before they play Golden State. -Donovan Mitchell has impressed me so much this season. At times I think he’s like Lebron out there and feels he needs to do everything. This is especially true since Rubio has gone down. For Utah to win they need unexpected performances from guys like Joe Ingles, Royce O’Neale and Alec Burks. Just not going to happen four times.